Many people work from home as editors and proofreaders. 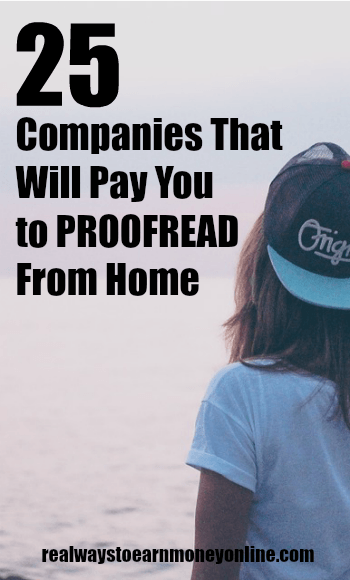 The following companies have either ongoing or occasional work available for people looking to work from home as editors or proofreaders. Keep in mind that most of these companies will require that you have experience before hiring you. We have included salary information as well if available. If you like this info, don't forget to sign up to get more like this in your inbox. We send home-based job leads if you become a subscriber. American Journal Experts – Hires work from home editors as remote contractors across various fields. According to Glassdoor, salary is $11/hourly on the low end and as much as $25 hourly on the high end. Scribe Writing – Not always hiring. Their editing and other gigs pay a flat fee of $3,000. Scribe salary for editors appears to be between $48 and $52 hourly. Cactus Communications – Read Cactus Work at Home Review – Prior English editing experience not required to become an editor for Cactus Communications. Worldwide openings. However, they do not hire people in New York. Editors here earn between $14 and $19 hourly on average. OneSpace – Read OneSpace Review – They have various editing and writing jobs and also offer smaller tasks like image tagging and website categorization for people looking to earn extra money from home. Edit 911 – Must have a PhD in English or another writing-intensive discipline. Edit Fast – This company pays 40 percent of the final project price to their editors. Enago – Hires freelance editors worldwide. Must have extensive experience and education to qualify. English Trackers – Applications aren't currently open for editing jobs at English Trackers, but be sure to keep tabs on the site if you're interested. You do need to be a native English speaker with two years of academic editing experience to be considered. You must also either have a PhD or have verifiable past experience. Gramlee – Claims to always be looking for exceptional editors to work at home. IXL Learning – Has occasional openings for remote content editor/proofreaders. Must have plenty of experience. Check their job openings page to see if position is listed. Kibin – Occasionally hiring freelance proofreaders and editors. If the job is closed, you can submit your email to find out when they're hiring again. Kibin copy editors reportedly earn between $17K and $19K per year. Kirkus Media – Frequently has openings for work at home editors, book reviewers, and also copywriters. LifeTips – Edit the content produced by LifeTips freelancers. Proofreading Pal – If you have at least five years of past proofreading experience, Proofreading Pal may consider you. Polished Paper – Polished Paper is regularly on the lookout for academic editors. You have to upload your resume and pass a 35-question editor test to be considered. Proofread Now – Five years experience as a professional proofreader. Not always hiring. Proofreading Services – Read ProofreadingServices Review – Open worldwide. They promise competitive pay and flexible hours. Scribbr – Read Scribbr Review – Open to UK, US, Canada, South Africa, and Australia. Must be a native English speaker to qualify. Scribbr editors may earn between $25 and $27 hourly. Scribendi – Read Scribendi Review – Scribendi pays people with experience to edit & proofread at home. You are hired as an independent contractor. Their editors reportedly earn about $25 an hour. Sibia Proofreading – Must have extensive editing experience, and must be a native English speaker to qualify. SmartBrief – Occasionally has openings for work at home copy editors with at least three years experience to work as freelancers. Pays $15 an hour. Under “Filter Jobs” and “Choose Area of Interest” select “Content” from the dropdown box to find any available editing positions. Editors for this company may earn as much as $50K a year. Wordfirm – Need at least three years of experience to work from home editing here. WordsRU – Need a degree and also two years of prior experience to be considered. Wordy – It looks like they have currently paused editor hiring, but they say it will resume again in the first quarter of 2020, so keep tabs on this one. If you don't like the idea of working under someone else, you can always start your own thing by proofreading for others. Here are two ways many of my readers are doing this, along with links to training that can help you learn how to set yourself up for success. You can earn good money at home by proofreading books, blogs, and websites. There is a HUGE demand for this! And no, you do not need a college degree. If you have a good eye for errors in text and know your grammar inside and out, you can do this. Another plus to proofreading for others on the side is that it's non-phone, and you work when and where you want. You can register for a free 45-minute workshop here that will introduce you to this field. The workshop shows you what good proofreaders do and don't do, how to elevate your skills, some places to find clients, and some information on an amazing proofreading tool. You can work at home as a court transcript proofreader and literally work from your iPad, setting your own schedule and rates. For example, check out this interview we've done with Caitlin Pyle a court transcript proofreader who did this for a living, and earned over $40,000 in a year! Caitlin also provides info and tips on how you can learn to do this and get official certification, with no degree or past experience in the form of an insanely popular online course (the 7-day intro course is FREE for everyone who is interested!). Post originally published June 11, 2012. Updated and republished on March 28, 2019. I have a BA Degree in Communications with a special emphasis ion editing. My experience includes 20 years professional journalism experience for newspapers. I am se34king a part time job working at home.